A gaggle of left-wing clergy is a tad upset that the Archbishops of Canterbury and York have used their General Election ‘Pastoral Letter‘ to exhort Christians to consider the need for stability in government. This, the clergy aver, closely associates them with the Conservative Party’s mantra of “strong and stable”, and so the archiepiscopal lurch to the right must be righteously repudiated. ..your conflation of the deeply-contested discourses of “our Christian heritage” and “our shared British values” (a conflation often appropriated by far-right nationalist groups) are also all deeply troubling. Just think about this. These are priests, deans, archdeacons (undoubtedly supported by many bishops) who seriously think that when a political party appropriates a word, phrase or symbol to their partisan and invariably vacuous cause, the Church should abandon it to them. So since Theresa May now owns ‘strong and stable’, Christian leaders should avoid using them – at least during an election campaign. And whatever you do, don’t fly the Union Jack or Cross of St George, because they’re owned by far-right BNP-Ukippy nationalist types, whom God loathes with a passion. You can guarantee, however, that these clergy would have had no problem at all with the Archbishops’ use of terms like ‘equality’ or ‘fairness’ or ‘justice for the many, not the few’, despite Jeremy Corbyn going on and on about these “politically freighted” virtues. If the message is about peace, nurture and tolerance, it is permissible; if it is about aspiration, competition and ambition, it is absolutely not. And so the Archbishops’ robust moral vision gets drowned out by a cacophony of love liberators, each believing that their hermeneutic embodies a superior theo-political righteousness, and the naive Archbishops must be corrected and rebuked “with urgency”. 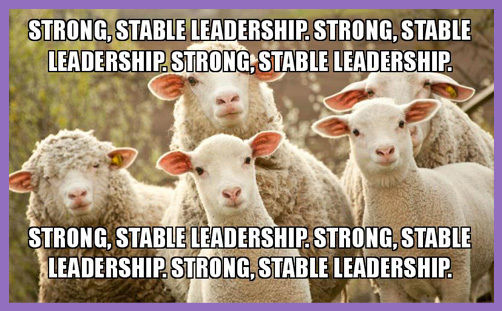 God desires and supports strong and stable government, so an archiepiscopal exhortation to ‘stability’ (they didn’t actually use the words ‘strong’ or ‘stable’) is consistent with the Christian ethic of governance. Human flourishing in societal diversity is contingent on structure, or “the beauty of order”, as Aquinas put it. And that order is contingent on stability, or it ceases to be inclined toward the common good. And that stability demands strong leadership of whatever polity to hold it all together, or it ceases to be just. When government is weak, it is unstable. When it is unstable, it becomes an imitation of law and justice; a tyranny of false representation. Implicit in strong and stable democratic government is the consent of the governed: if they do not accept the moral basis of law or the legitimacy of the legal order, we move toward anarchy and tyranny, and so strength and stability become cohesive. For Theresa May – a practising and devout Christian – her politics is ordered toward the furtherance of God’s kingdom on earth. She won’t put it in those terms, of course: ‘doing God’ has been sacrificed on the altar of secularity, or at least doing God in a robust way. But you can’t maintain law and order if your government is not strong. You can’t relieve the poor, free the oppressed, provide for common peace or execute justice if your government is not stable. A politician needs all the potency and constancy of a priest, and you’d expect a mass of clergy – even lefty ones – to understand that both their vocations depend upon it. Scripture teaches that those who exercise political authority are commissioned and empowered by God (Rom 13). They are endowed with divine authority and are not to be despised but prayed for. Transformative peace and reconciliation are contingent on the moral foundations of strength and stability. It is not partisan to point this out during a General Election campaign, even if one political party has appropriated the essence of the words as a slogan. Indeed, the urgent Christian task then is to redeem the shallow words and preach a deeper truth. Just because a political party preaches that its government will be strong and stable does not mean that it will be so: democratic politics is sophistry, after all. But priestly politics should not be so, at all.